There she was, Marie LashHands, with two tweezers and a prosthetic lash in hand. I had always wondered what went down in these lash bars. How many people a day were getting their lashes extended? Apparently enough. You can find DekaLash all across the United States. The amount of studios they own will soon surpass the amount of states we have. Lashes have become America’s new Big Mac for the eyes. I for one fell into the hype and now I’ve transformed into a butterfly princess. Will I ever go back to using mascara? One of their studios opened up this past month in West Caldwell, NJ. Through Instagram I found out they were looking for training models. Quickly did I dial the number and made my very first appointment. I was shocked to learn that it would be a two hour process. What were they going to do to me? Eye Surgery? Upon my arrival I found myself in a futuristic lash bar. Where three beautiful women greet you with warm smiles and hibiscus ginger tea. Is this Heaven? Marie the Manager guided me to where I would find myself sleeping for two hours. A massage chair, two sectional pillows and a blanket awaited my naked eye lids. We had a ten minute consultation to which I replied “Do As you Please, I am here for the experience” Off I went into a cocoon as she played with my eyelashes. It was a very strategic process, one by one, she attached the synthetic lash to my real one with glue, almost like a weave if you have ever had one. At first we chatted about her life, her career and then I quickly dozed off. She was super cool with me waking up every now and then to pick up where we left off. It was like having someone brush your hair. Two hours felt like fifteen minutes. I felt like I was just getting to know her when she said I was done and how beautiful I looked. Where was I?. You know that mirror in Beauty and The Beast where she could see where who she most loved. That was me, looking at myself a princess of lashes. Matter of fact, the queen! Man do my lashes look on point. I had zero expectations of what they would look like. This was beyond, I transformed, and now wondering why my former self waited so long. Who needs contouring when you’ve got bomb.com lashes! So now the question is, how am I going to convince my husband I need $120 a bucks for lash weave? You lose 3 eyelashes a day, 42 in a week. They do look great – incredible that you were able to have a good sleep as well – must have been a therapeutic experience. Expensive but wow what a wonderful effect. The ultimate treat and no need to mess about with mascara each day! Your lashes look amazing! I have always wanted to do this. I’ve been seeing a lot of people getting lash extensions. It’s something I’ve always wanted to try. You look great! I had false lashes for years and just recently am trying something new. I love how they looked though! 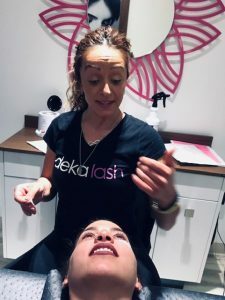 This is a really thorough discussion about what to expect if you get lash extensions. Great information! Your lashes look beautiful and so natural. Your lashes look amazing! I didn’t realise we lost that many eyelashes in a week! this is so amazing! i havent tried it but i think i will, just seeing your blog convinced me do it! Great lashes! Those really pop well! I would love longer lashes, but don’t know much about this process. I bet you’re so excited to have longer lashes! I never tried to ahve a lashes extension. But I ahve seen my friends and it was really gorgeous. These lashes turned out so amazing! I think you look absolutely fabulous. I totally get you on falling asleep! 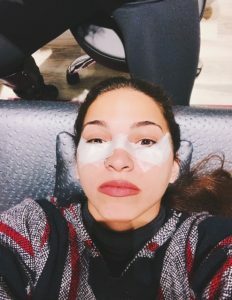 I have fallen asleep in skincare appointments (lol!) and I am dying to try some lashes on! They look really nice! I have thought back and forth about trying them but not sure yet. Woweeee they look amazing! I wish I was brave enough to have them done! One day I’ll save up and have a lash weave!